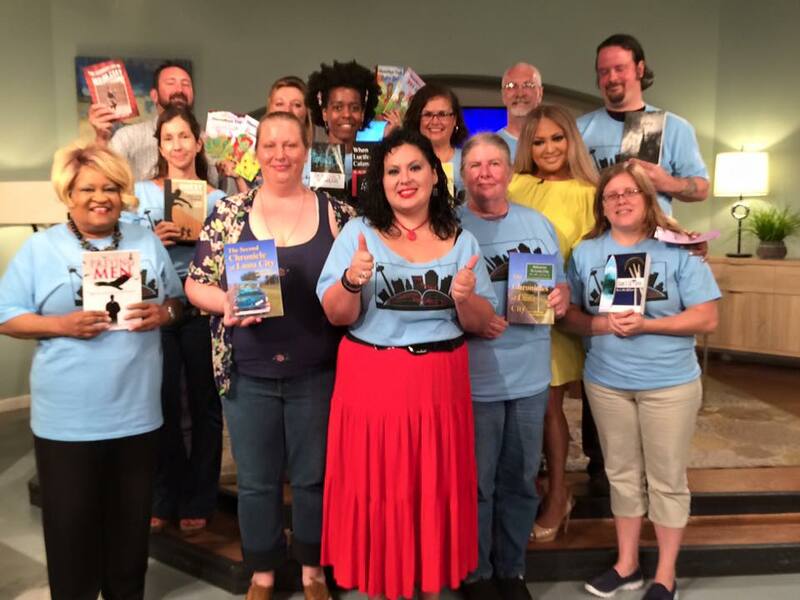 So – the Daughter Unit and I spend the greater part of Monday morning doing our bit for the San Antonio Indy Authors and our second bookfest, this coming Saturday. C.M. 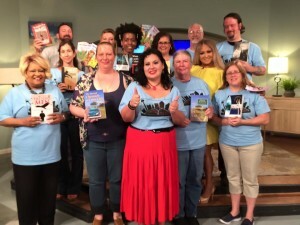 Bratton, our tireless organizer for this bookfest and last years’ managed to get us a bit of publicity on the KENS-5 mid-morning show, Great Day SA. What with one thing and another over the years, we’ve been to their studios over on Fredericksburg Road – the last time was for the first bookfest, so the Daughter Unit and I knew the drill. Meet with C. M. and the other authors in the visitor parking lot, draw our special T-shirts, sign in on the guestbook in the lobby, get a badge from the receptionist, be escorted in a group to the studio, and find places for ourselves on the bleachers. I don’t know what it is for Good Morning SA when there isn’t a fairly substantial group of people, but it appears that the guests generally serve as the in-studio audience, and rotate into position when their segment comes up. All very structured, of course; a snippet of news, a weather and traffic report, and then on to the light and fluffy stuff. Oddly enough, I found this program very comforting after the last couple of weeks of news; a long hot summer of race riots, ISIS coming up with horrible new ways to execute people, Europe melting down over Brexit, rumblings of menace from China and Russia … really, I was beginning to dread turning on the computer of a morning and discovering some fresh hell in the headlines. So – let’s see; what was a summer Monday on Great Day SA all about? Well, there was a franchise ice cream parlor owner, who demonstrated how to whip up instantly frozen ice cream by using liquid nitrogen. I really couldn’t see from where I was sitting in the bleachers – but it seems that it involves stirring in a dash of liquid nitrogen into the ice cream base. It was just hard to tell, with all the white clouds of vapor, dissolving all over the place. And then – a bit about how to keep dogs comfortable in the summer; the owner of a doggie day care and spa, which has a swimming pool for dogs, was interviewed, with one of her dogs on hand. He was a big brown cupcake of a pit named Moose, who was a bit restless but otherwise well-behaved. There is a special kind doggie ice cream, it appears; a specially formulated frozen whey, which is better for them than cream and sugar. There were three performers and two puppets from the Magik Theater, and the theater manager, doing a song from their current production; La Cinderella. This is a musical adaptation of the Cinderella story, set in Spanish Colonial San Antonio. And then – a new hospital facility opening up; specializing in physical therapy and rehabilitation – which looks to be quite awesomely well-appointed. The pictures of the lobby looked like the lobby of a particularly luxurious hotel. And then – our bit, at the end of the hour, with C. M. wrapping it all up and the rest of us holding up our books. Not a bad way to kill a morning, and if it brings out crowds to Say Si on Saturday, then all to the good!